You're a big sister! How did that happen? How are you old enough, big enough to have someone younger and smaller than you in our little family. 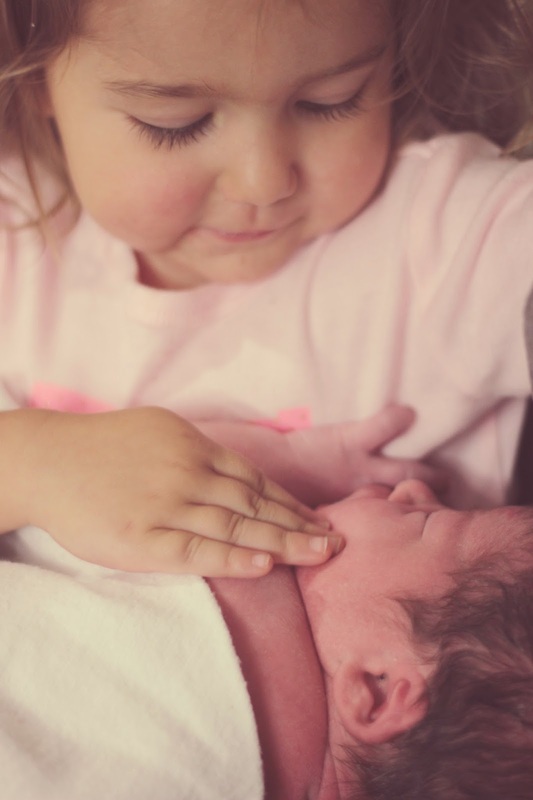 You are already the best big sister to your little brother. You are so sweet, so loving, and so helpful. I was nervous how you'd react when we brought your brother home. I was afraid you'd poke his eyes out, try to feed him your crackers, and I'd have to continually tell you to be more gentle. But not once since we've been home have I had to worry about you. You're so gentle with Theo, you love giving him kisses, you love to hold him (even if it is for 2.5 seconds), you love to sing him songs, and the first question you ask in the morning is "where's baby brother?". I'm so proud of you, sweet girl. You're growing up way too fast but I love seeing you learn new things and become more of girl and less of a baby. You're a sponge right now and I swear you're a genius (I may be biased). You love singing, especially to Mumford and Sons. You enjoy drawing and I think you've inherited your Daddy's artistic abilities. Your fearlessness is going to be the death of me (or just make me pass out every now and then when you come crying to me with a broken appendage). You'll always hold a special place in my heart being my first child and my first (maybe only) girl. I pray you'd continue to grow in wisdom and stature and that Christ would always be the center of your joy. I love you, my sweet Anna Jubilee. You're finally here! A week early nonetheless; and while we weren't quite ready for you (considering you didn't have a name for the first 12 hours of your life), I'm not complaining. You, sir, are one special guy. You have your sister head over heals in love with you, and your Mommy and Daddy are pretty smitten as well. As soon as you entered the world my first words were "I love him so much! ", and after taking a good look at you I realized how much you resembled Anna. For a few days I felt like I was reliving two years ago. But now, after two weeks, you're beginning to look less and less like your big sister and you're becoming your own person. I love it. Your eyes are starting to lighten, I can't wait to see what color they'll finally settle on. Will they stay blue like your Daddy's or turn brown like your sister's or will they change to a green like mine? Your cheeks are starting to fill out and become more and more kissable. You're still so fuzzy and soft and your sweet baby scent takes my breath away every time (or maybe that's all the poopy diapers!) You're always making noises and they are the funniest. The other night, I swear, Predator took over my son. One minute you sound like an alien, the next you sound like a velociraptor. I wished for a cuddly baby, and boy, did I get one! You won't let me put you down for a second. It makes for long nights since you don't sleep well if you're not on mine or your Daddy's chest. But that's ok. We can't stay upset for long because we just look at you and our hearts melt all over again. You have added so much to our little family. I already forget what life was like without you (more sleep, that's for sure!). I pray you would always know the love of the Father and that as you grow you would look to Him in all things. I love you, my precious Theo Shepherd. We love you guys dearly!!! CanNOT wait for our kids to grow up knowing each other.